For the film, see Fort Bliss (film). Fort Bliss is a United States Army post in New Mexico and Texas, with its headquarters in El Paso, Texas. Named in honor of LTC William Bliss (1815-1853), a mathematical genius who was the son-in-law of President Zachary Taylor, Ft. Bliss has an area of about 1,700 square miles (4,400 km2); it is the largest installation in FORSCOM (United States Army Forces Command) and second-largest in the Army overall (the largest being the adjacent White Sands Missile Range). The portion of the post located in El Paso County, Texas, is a census-designated place with a population of 8,591 as of the time of the 2010 census. Fort Bliss provides the largest contiguous tract (1,500 sq mi or 3,900 km2) of restricted airspace in the Continental United States, used for missile and artillery training and testing, and at 992,000 acres boasts the largest maneuver area (ahead of the National Training Center, which has 642,000 acres). The garrison's land area is accounted at 1.12 million acres, ranging to the boundaries of the Lincoln National Forest and White Sands Missile Range in New Mexico. 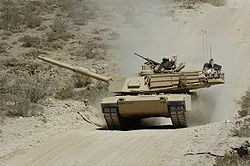 An Abrams tank crew on Fort Bliss’ Doña Ana Range in 2006. Fort Bliss is home to the 1st Armored Division, which returned to US soil in 2011 after 40 years in Germany. The division is supported by the 15th Sustainment Brigade. The installation is also home to the 32nd Army Air and Missile Defense Command, the 11th Air Defense Artillery Brigade, the 212th Fires Brigade (now reflagged as the 1st Armored Division Artillery Brigade), and the 402nd Field Artillery Brigade. On 11 January 1854, Companies B, E, I and K of the 8th Infantry, under the command of Lt. Col. Edmund B. Alexander, established Post of El Paso at Magoffinsville under orders from Secretary of War Jefferson Davis. :23 The post was named Fort Bliss on 8 March 1854:23 in honor of Lt. Col. William Wallace Smith Bliss, a veteran of the Mexican War (1846-1848) who was cited for gallantry in action. After May 1867 Rio Grande flooding seriously damaged the Magoffinsville post, Fort Bliss was moved to a site called Camp Concordia in March 1868.:35 Camp Concordia's location was immediately south of what is now Interstate 10, across from Concordia Cemetery in El Paso. The Rio Grande was about a mile south of the camp at that time; water was hauled daily by mule team to the camp. On 11 March 1869 the old name of Fort Bliss was resumed. :36 Water, heating, and sanitation facilities were at a minimum in the adobe buildings of the fort; records reveal that troops suffered severely from dysentery and malaria and that supplies arrived irregularly over the Santa Fe Trail by wagon train. The Concordia post was abandoned in January 1877,:36 and after troops left in January, El Paso was without a garrison for more than a year. By that time, the town and its environs on the north side of the river had swelled to a population of almost 800. Aerial view of Fort Bliss, 1968, with N-El Paso in background. On New Year's Day,1878,:36 Fort Bliss was established as a permanent post; the Company L Buffalo Soldiers of the Ninth Cavalry and Company C of the 15th Infantry, were sent to Fort Bliss to prevent further trouble over the salt beds and the usage of Rio Grande water for irrigation purposes. :36,39 Prior to this date, the government had had a policy of simply leasing property for its military installations. Now, however, a tract of 135 acres (0.55 km2) was purchased at Hart's Mill on the river's edge in the Pass, near what is today the UTEP. With a $40,000 appropriation, a building program was begun. The first railroad arrived in 1881, and tracks were laid across the military reservation, thereby solving the supply problems for the fort and the rapidly growing town of El Paso. By 1890, Hart's Mill had outlived its usefulness, and Congress appropriated $150,000 for construction of a military installation:50 on the mesa approximately 5 miles (8.0 km) east of El Paso's 1890 city limits. Although no money was appropriated for the land, $8,250 was easily raised by the local residents, who realized the economic benefit to the area. During this time, the military airfield in El Paso would become one of the homes to the United States Army Border Air Patrol and the 1st Aero Squadron, the U.S. Army's first tactical unit equipped with airplanes. During World War II, Fort Bliss focused on training anti-aircraft artillery battalions (AAA). In September 1940 the Coast Artillery's anti-aircraft training center was established, and in 1941 the 1st Tow Target Squadron arrived to fly target drones (the 6th, 19th, and 27th Tow Target Squadrons were at the nearby Biggs Field). On 3 August 1944, the Anti-Aircraft Artillery School was ordered from Camp Davis to Fort Bliss to make the training of anti-aircraft gunners easier, and they became the dominant force at Fort Bliss following the departure of the U.S. 1st Cavalry Division. On 15 September 1942, the War Dept. made space available for handling up to 1,350 POWs, while POW camps could be constructed. During the war, the base was used to hold approximately 91 German and Italian Americans and Japanese from Hawaii (then a territory), who were arrested as potential fifth columnists but, in most cases, denied due process. Fort Bliss trained thousands of U.S. Soldiers during the Cold War. As the United States gradually came to master the art of building and operating missiles, Fort Bliss and White Sands Missile Range became more and more important to the country, and were expanded accordingly. On 1 July 1957 the U.S. Army Air Defense Center was established at Fort Bliss. Located at this Center, in addition to Center Headquarters, are the U.S. Army Air Defense School; Air Defense; the 6th Artillery Group (Air Defense); the 61st Ordnance Group; and other supporting elements. In 1957 Fort Bliss and its anti-aircraft personnel began using Nike Ajax, Nike Hercules, Hawk, Sprint, Chaparral, and Redeye missiles. Fort Bliss took on the important role of providing a large area for troops to conduct live fire exercises with the missiles. A U.S. Patriot Missile fires from its launch canister. In 1995, the Department of Defense recommended that the U.S. 3rd Armored Cavalry Regiment be relocated to Fort Carson, Colorado. Efforts to consolidate units from another post with those units that remained at Fort Bliss were overruled by the Base Realignment and Closing Commission, leaving Fort Bliss without any armored vehicles. Units operating the US Army's MIM-104 Patriot Missile Defense System relocated to Fort Bliss during the 1990s. The Patriot system played an important role in the Persian Gulf War/Operation Desert Storm in 1991. In commemoration, the US 54 expressway in northeast El Paso was designated the Patriot Freeway. In 2005, the Pentagon recommended transforming Fort Bliss into a heavy armor training post, to include approximately 11,500 new troops from the U.S. 1st Armored Division – at that time stationed in Germany -, as well as units from Fort Sill and Fort Hood. An estimated 15,918 military jobs and 384 civilian jobs were planned to be transferred to Fort Bliss, brought the total number of troops stationed at Fort Bliss under this alignment to a total of 33,500 by 2012. Officials from Fort Bliss and the City of El Paso were thrilled with the decision; the general mood of the city government was perfectly captured by 14 May edition of the El Paso Times, which boldly proclaimed "BLISS WINS BIG". Training missions are supported by the McGregor Range Complex, located some 25 miles (40 km) to the northeast of the main post, in New Mexico. Most of Fort Bliss lies in the state of New Mexico, stretching northeastward along U.S. Route 54 from El Paso County, Texas to the southern boundary of the Lincoln National Forest in Otero County, New Mexico; in addition, much of the northwestward side of Highway 54 is part of the Fort Bliss Military Reservation, ranging from the northern side of Chaparral, New Mexico to the southern boundary of White Sands Missile Range; the main facilities are within the city limits of El Paso, Texas. According to the city zoning map, the post officially resides in Central El Paso. Separate from the main post are the William Beaumont Army Medical Center (which also serves the warrior transition battalion for the post's wounded warriors) and a Department of Veterans Affairs center at the eastern base of the Franklin Mountains. All of these supporting missions serve the military and retired-military population here, including having served General Omar N. Bradley in his last days. A new warrior transition complex, located at Marshall and Cassidy roads, was opened in June 2011 to replace the older facility serving the warrior transition battalion. A new location for William Beaumont Army Medical Center, to be located at Spur 601 and Loop 375, is now rescheduled to be completed in September 2019. Fort Bliss soldier running up McKelligon Canyon for his daily PT. Fort Bliss has also assisted El Paso during local disasters. In 1897, and again in 1925, the fort provided food and housing to those displaced by flood waters. In 2006, Fort Bliss dispatched soldiers and helicopters to the flood-affected areas to help with rescue efforts there. The flooding of El Paso in 2013 and 2014 were not met with this type of official response. As of July 2010, electric power consumption at Fort Bliss had been reduced by three megawatts as the base continues to work towards becoming a "net zero" energy installation. In April 2013, Major General Dana J.H. Pittard, USA, announced a $120 million project to be completed by 2015, consisting of the largest solar farm within the U.S. military. Fort Bliss archaeologists manage 20,000 sites on the 1.12 million acre reservation, and serve as tribal liaison to seven federally-funded Indian tribes. The Hueco Tanks historic site in El Paso county is adjacent to the military reservation. Cultural liaison with the tribes at the sacred sites of the reservation is an annual event. Aerial view of El Paso with Fort Bliss's Armstrong Polo Field in the center. The Pershing Dam flood-control project floods the field when there is storm runoff. Location of the census-designated place in El Paso County. The Fort Bliss census-designated place is located at 31°48′07″N 106°25′29″W﻿ / ﻿31.801847°N 106.424608°W﻿ / 31.801847; -106.424608. According to the United States Census Bureau, the census-designated place has a total area of 6.2 square miles (16.0 km²), all of it land. In terms of its United States physiographic region, it is a southern part of the Basin and Range Province. An investigation into above-ground dirt-covered bunkers located on the military reservation was opened in June 2013. These former nuclear weapons bunkers were used by the Air Force during the Cold War, when Biggs Air Force Base was a SAC base. Low level radiation was detected in Bunker 11507. The bunker interiors were previously painted with epoxy paint to contain the radiation, and the paint has now chipped. The radiation contamination is confined to the area around the bunker. The area was closed on 11 July 2013. Buffalo Soldier Gate marker explaining the history of the Post opposite El Paso Del Norte from 1849 to the present. Replica Museum of the Magoffinsville-era fort. Former Fort Bliss buildings at Hart's Mill location. Replica Museum marker explaining the fort's Civil War history. The 2016 outdoor display still includes a V-2 rocket. The Fort Bliss Main Post Historic District, a large historic district including 343 buildings deemed to be contributing, was listed on the National Register of Historic Places in 1998. ^ a b c d "Fort Bliss". GlobalSecurity.org. Retrieved 24 September 2006. ^ A total of five areas have housed the military post from its original creation to the present; this time frame takes into account the construction for each. ^ a b c d e f g h i j k l m n o p q r s t u v w x y Metz, Leon Claire; Tom Lea; Jose Cisneros (1988). Desert Army: Fort Bliss on the Texas Border (1st paperback ed.). El Paso, Texas: Mangan Books. ISBN 0-930208-36-6. Retrieved 9 October 2008. NOTE: At the time of its creation, the first post occupied territory that was considered to be part of New Mexico, and the post remained the strongest military encampment in New Mexico until the 32nd parallel north was designated the official boundary between New Mexico and Texas in 1850. ^ "History of Fort Bliss". Post Guide and Telephone Directory. Laven Publishing Group. Archived from the original on 5 May 2009. Retrieved 14 December 2008. ^ Frank Mangan (1971), in El Paso in Pictures, Texas A&M Press, ISBN 978-0-87565-350-1 locates the Magoffinsville post at the intersection of Magoffin and Willow streets, based on photographic inspection of the contours of Mount Franklin in a photograph of Fort Bliss. ^ "Information taken from the Fort Bliss Museum website". United States Army. Archived from the original on 14 July 2007. Retrieved 21 September 2006. ^ Harris, Major Kevin L. "Guardian of the Pass: the story of the U.S. Army in El Paso". ^ NOTE: After a year at Fort Bliss, Pershing decided to arrange for his family to join him. The arrangements were almost complete when, on the morning of 27 August 1915, he received a telegram telling him of a fire in the Presidio of San Francisco. His wife and three young daughters had been burned to death; only his six-year-old son Warren had been saved. Many who knew Pershing said that he never recovered from the deaths of his wife and daughters. After the funerals at Lakeview Cemetery in Cheyenne, Wyoming, Pershing returned to Fort Bliss with his son, Warren, and his sister Mae, and resumed his duties as commanding officer. ^ Krammer, Arnold (1979). Nazi Prisoners of War in America. New York: Stein and Day. p. 27. ISBN 0812825713. ^ Huzel, Dieter K (1962). Peenemünde to Canaveral. Englewood Cliffs NJ: Prentice Hall. pp. 210, 214. ISBN 0-313-22928-7. ^ Ley, Willy (1951 (revised edition 1958)) . Rockets, Missiles and Space Travel. New York: The Viking Press. p. 246. Check date values in: |year= (help) NOTE: In 1948, the United States honored the 100th year of Fort Bliss with a commemorative stamp depicting a rocket launch, the first stamp ever issued by the US related to space efforts or to depict a rocket. ^ a b "Corporal history" (PDF). p. 249,263. Archived from the original (pdf) on 13 November 2005. In 1960, organizational control of the MGM-5 Corporal transferred from the ARGMA to the ABMA. ^ During this time the 3rd Armored Cavalry Regiment was also assigned to Fort Bliss, and later relocated to Fort Carson, Colorado. United States Army. "HISTORY OF FORT BLISS". Archived from the original on 17 February 2006. Retrieved 23 September 2006. ^ "Air Defense Artillery School". GlobalSecurity.org. Retrieved 9 October 2008. ^ NOTE: Two other surface-to-surface missile systems—LaCrosse and Honest John— were based at Fort Sill, Oklahoma, but would frequently come to Fort Bliss for the purpose of conducting live fire exercises. ^ Spc. Jonathan W. Thomas. "Fort Bliss switches from TRADOC to FORSCOM". www.army.mil. p. 1. Retrieved 2 July 2009. ^ "Bundeswehr streicht Ausbildung in den USA" (in German). Retrieved 16 February 2012. ^ "CRC goes live August 9, 2013". Retrieved 16 October 2014. ^ "MG MacFarland (9-17-2013) Fort Bliss Bugle". Retrieved 16 October 2014. ^ "Philip Varela and Chris Fumagalli. Early Fort Bliss Occupied Pioneer Sites. EPCC: Borderlands". Retrieved 16 October 2014. ^ "Autumn-Winter 2006-2007 Newsletter" (PDF) (Press release). El Paso/Santa Teresa. National Weather Service. 2007. p. 6. Retrieved 24 June 2017. ^ C. Todd Lopez (8 July 2010). "Lopez, C. Todd. "Fort Bliss moving toward 'net-zero' energy compliance." The United States Army Homepage. N.p., 8 July 2010. Web. 12 July 2010". Retrieved 16 October 2014. ^ PSR News Staff (6 April 2013). "Fort Bliss Announces Military's Largest Solar Power Project". PSR News, International. Retrieved 16 February 2014. ^ Miles, Donna (5 April 2013). "Fort Bliss to Launch Military's Largest Renewable Energy Project". DOD/American Forces Press Service. Archived from the original on 21 February 2014. Retrieved 16 February 2014. Wikimedia Commons has media related to Fort Bliss, Texas.